John Kaiser of Kaiser Research online joins GoldSeek TV Anchor Vanessa Collette to discuss China's gold holdings, the focus on environmental clean up in the country, the case for investing in scandium and scandium deposits held by junior mining stocks. Hi, my name is Rick Rule. I'm the Chief Executive Officer of Sprott U.S. Holdings, one of the leading natural resource investment and money management firms in the world. I've personally been in the natural resource business for over 30 years. I've visited hundreds of mining sites on every single continent but one, and my firm has helped finance hundreds of resource companies – everything from the tiniest junior gold, oil, and uranium miners to huge, publicly-traded gold and silver royalty companies, some of which you may own. Last week beginning Tuesday, July 28th, at the Fairmont Hotel in downtown Vancouver, I co-hosted an important meeting along with my colleagues at Stansberry Research. Over the course of four days, we presented the world's leading specialists on gold and natural resources – including top CEOs, hedge fund managers, mining and exploration experts, and other executives from the some of the most successful resource companies in the world. Together we addressed one of the most important financial events of our time -- the global currency war, and why 2015 could prove to be one of the best times in history to invest in precious metals and other resources. I’m sorry if you couldn’t join us in person but we understand that for many folks it wasn’t practical to make the trip. That's why I've arranged a way for you to get an online access pass to video and MP3 recordings of the exciting 2015 Vancouver Natural Resource Symposium – for a fraction of the cost of an in-person ticket. At your leisure, in the comfort of your own home, you’ll have the chance to hear great ideas from the resource and financial experts in our lineup – including special guest keynote speakers, Bill Bonner, James Rickards, Doug Casey, and many more. The timing really couldn’t be better. The gold market today looks a lot like it did in 2000, right before it went on a ten-year roll. In 2000, you may remember, most people couldn't have cared less about gold. It was trading for around $280 an ounce. By 2011, gold was trading as high as $1,900 – up over 550%. It seems that right now, today, we have many of the same conditions that spurred the last big gold market runs in 2000 and 2009. The thesis is straightforward: Central banks are cutting rates, printing money, and engaging in all-out currency wars. The U.S. alone has tripled its money supply since 2008 and literally doubled the national debt since 2009 to $14 trillion, and it's still growing. And gold is already up, in virtually every currency except the US Dollar. Obviously, this can’t – and won’t – end well. In fact, today's record-low interest rates around the world make gold and natural resources an attractive alternative. Gold pays no interest, so it's much more appealing when government bonds have zero (or negative) yields, like we have right now. Finally, if you follow the Toronto Venture Exchange – where junior mining and exploration companies trade – it looks very similar to how it looked the last time we had conditions like this. By the end of 2014, the index was down 73% since March 2011, and 80% from its all-time high in 2007. As you can see by the chart, gold stocks could hardly be more out-of-favor right now. But you can also see what happens to this index after the bottom is in. The very best gold and precious metals companies – with the best projects and the strongest management – could be attractive investment vehicles for profiting on a turnaround in the gold price. With your online access pass to the Symposium Video & Audio MP3 recordings, you’ll hear all about these companies, at an event that was completely different from any other conference with some of the most important people in the gold and mining industries. And of course, you’ll get tons of great, actionable ideas, the same as if you’d been right there with us in Vancouver. The recordings begin with the opening session on July 28th. You’ll hear from top-rated people in the business and exactly what these pros are predicting for gold, silver, and other natural resources. Every single invited guest at this year's Symposium was vetted personally by either me or someone on my team. And we believe we know everyone who matters in the world of resource companies. This ensures that you’ll hear the best ideas – directly from the most respected people in the field. I was the host throughout the four-day symposium – and this year, we truly had a spectacular guest lineup. A true legend in the natural resource business – Eric Sprott, Chairman and Founder of Sprott Asset Management. There are very few folks in the business who have achieved more than Eric, with over 40 years of experience in the investment industry, and 37 years managing client funds. An avid First Nations art collector, as well as a renowned philanthropist, Eric gave the keynote address in Vancouver this summer, and you'll have the opportunity to see his whole presentation from the comfort of your own home or office. You’ll hear from legendary free-market thinker Bill Bonner, founder of Agora Inc., one of the largest independent newsletter publishing companies in the world. In his daily newsletter, Diary of a Rogue Economist, Bill shares his decades of accrued knowledge about history, politics, society, finance, and economics. Sometimes funny, sometimes frightening – you’ll find his commentary in Vancouver entertaining and packed with useful insight. We've also invited one of the smartest guys and greatest speculators we know, Doug Casey, to share his latest ideas, predictions, and favorite gold opportunities. If you've never seen Doug speak, I promise it's an experience you won't soon forget. Doug doesn't suffer fools gladly, and he's not afraid to say exactly what's on his mind. For decades, Doug has been the ultimate contrarian -- and as a result, he's been able to uncover some incredibly profitable opportunities in the markets. David Harquail, CEO of Franco-Nevada. David led the successful IPO and listing of Franco-Nevada onto the Toronto Stock Exchange in late 2007 for $1.2 billion. Randy Smallwood, CEO of Silver Wheaton, one of the largest precious metals royalty companies in the world. You’ll also hear from Stansberry Research, our co-hosts for the 2015 Vancouver Symposium. For over a decade, Matt Badiali’s work as Stansberry’s “boots on the ground” resident geologist and natural resource expert has taken him to Papua New Guinea, Iraq, Hong Kong, Singapore, Haiti, Turkey, Switzerland, and many other locations around the world. As Matt says, to make the biggest gains in this sector, you have to buy natural resource assets when nobody wants them. And in this re-play, you'll hear from Matt on his favorite ideas right now. Stansberry analyst Dan Ferris, editor of Extreme Value has earned a loyal following by finding safe, cheap and profitable stocks since 2002, as well as one of the most impressive track records in the industry. As Dan recently wrote, "Small-cap natural resource stocks are where I see huge opportunity today," and Dan will reveal his favorites in the sector. Dan’s Vancouver Video & Audio MP3 recordings will be there for you to go back to again and again. Finally, you'll also have a chance to hear from Stansberry's senior analyst, Dr. Steve Sjuggerud. Steve is the editor of the popular True Wealth advisory letter, which is based on the simple idea that you don't always have to take big risks to make big returns. Recently he told his True Wealth readers that it's the perfect time to get back into gold and gold stocks. You can hear Steve share his latest thoughts on the gold market – without leaving your home or office. As you can see, we had a ton of great content on the gold and natural resources markets lined up for you this year. But with your online access pass to the Video and Audio MP3 recordings, you can have it all right at your fingertips and watch at your leisure… as easy as turning on your computer or device. In just a moment, I'll also show you how to secure a significant discount on your online access pass to the Vancouver recordings, as well as two complimentary resources from me personally that will help you get the most out of everything we have planned for the Symposium. Let me introduce you to a sampling of outstanding guests at this year’s Symposium who shared their thoughts about gold and precious metals… natural resources… the global currency war… the ultimate demise of the dollar… and what happens next. Brent Cook, Editor of Exploration Insights, has been an economic geologist and mining analyst in the minerals exploration and mining business for over three decades. Adrian Day, of Adrian Day Asset Management, specializes in international gold, precious metals, and natural resource investments. Chris Mayer, Editor of Capital & Crisis, began his career as a corporate banker and served as the vice president of corporate lending at Provident Bank. Ten years later, in 2004 he signed on with Agora Financial and is the managing editor of the Capital and Crisis and Mayer’s Special Situations newsletters. Byron King, Editor of Outstanding Investments is a Harvard-trained geologist and former aide to the United States Chief of Naval Operations. King is a long-time world traveler who's gotten his boots muddy on five continents in search of the world's best natural resources opportunities. Frank Trotter, President of EverBank Direct. A founding partner of EverBank.com in 1998, he has acquired more than 30 years of experience in the banking industry. Frank is a featured speaker on financial topics at venues around the world, especially global market developments, and has been featured in The Wall Street Journal,New York Times, Bloomberg, TheStreet and others. Sean Brodrick, Editor of Oxford Resource Explorer, is a resource analyst with much boots-on-the-ground experience. He's traveled from diamond fields north of the Arctic Circle, to an ancient city of silver in Mexico, to a gold project on the frigid southern tip of Argentina – and just about everywhere in between. Marin Katusa, President of Katusa Research. Over the last decade, he has worked directly with and financed many companies of well-known individuals in the resource industry and has become one of the most trusted and well-connected dealmakers in the junior resource sector. John Kaiser is an independent analyst who has covered the junior resource sector since 1983. He's the founder of Kaiser Research Online, an information portal covering the Canadian publicly listed resource sector and the publisher of his Spec Value Hunter recommendations. Keith Schaefer is editor and publisher of the Oil & Gas Investments Bulletin, where he researches and profiles growing oil and gas companies that he also buys himself. Keith has spent over 15 years helping resource companies raise capital for exploration and development. With your Video & Audio MP3 Online Access Pass to Vancouver, you’ll be able to watch all of these presentations wherever you choose and as often as you like. When you view the 2015 Sprott-Stansberry Natural Resource Symposium recordings, you'll know firsthand the important details about the state of the market today, and why it bodes well for gold, precious metals, and other natural resources in the coming months and years. If you're looking for ideas in gold and resource stocks… if you want to know about the trends taking place in the market… if you want to get investment ideas from world-renowned gold and resource experts… I strongly urge you to book your Video & MP3 online access pass to the 2015 Sprott-Stansberry Vancouver Natural Resource Symposium today. This is an opportunity to experience a first-rate, first-class event at your leisure, in the comfort of your home… and hear from our lineup of top-notch guests… and get access to the kinds of ideas the average investor will simply never hear about. "This was, quite literally, one of the best conferences I have attended. I expect to enthusiastically choose to attend in future years, especially if the symposium continues to be held in Vancouver." - Raymond E.
CONGRATULATIONS – Your Conference was a GREAT success! "Thanks again for all your effort in putting on such a great conference. As someone who helped organize four to six conferences a year for 20 years – I never saw such strong attendance on the final day as you had on Friday – very impressive." - Paul S.
Naturally, it's hard to put a price on something like this. Considering everything we provided, and the financial overhead to secure the hotel and our invited guests, we could have easily charged $1,800 or more per in-person ticket to Vancouver 2015. But when you sign up for your Video & Audio MP3 online access pass today, you'll pay just a small fraction of that. #1. Four (4) days of General Session speakers where we covered the most important financial ideas and investment opportunities in the gold and resource markets... market analysis... and much, much more. Plus, you’ll have a “front row” seat at “backroom” breakout sessions that featured speakers like Dr. Steve Sjuggerud, Doug Casey, Matt Badiali, special guest CEOs like Morgan Poliquin of Almaden Minerals, and more. All recorded in crisp, easy to use video & MP3s that you can access from anywhere in the world, anytime you want because they’re all online. A Guide to Natural Resource Investing - In this complimentary Report – which I'll email to you right after you secure your online access pass -- I'll share with you the collective experience and insights my firm and I have accumulated over the past 30 years of investing in gold and natural resources. Squeezing a Dollar Out Of a Dime – Getting Your Money's Worth at the 2015 Sprott/Stansberry Vancouver Natural Resource Symposium. We want to make sure that this year's event is the absolute best and most valuable conference you'll ever see. That's why I put together a short video with my colleague Tekoa Da Silva at Sprott, where I share my 40+ years' experience as both a conference presenter and attendee. #3. PowerPoint Presentations – As an added bonus, we’ll also send you all of the speakers’ PowerPoint presentations that were provided at the Symposium. #4. And There’s One More Bonus! – I’m including a $100 Discount Coupon for the 2016 Vancouver Natural Resource Symposium. This is an event I don’t want you to miss! As you can see, we've gone out of our way to make sure the Sprott-Stansberry 2015 Vancouver Natural Resource Symposium exceeds every expectation. Even if we charged $1,000 or more for online access to Video & Audio MP3 recordings, it would still be an incredible deal. When you consider the level of expert guests you'll have a chance to hear from, and the benefits this kind of information could yield in the months and years ahead… this might be worth FAR more than the price of an in-person ticket. But when you secure your Video & Audio MP3 Online Access Pass to Vancouver today, you'll pay just $249 for all four days of presentations. "A quick note to say thank you to all of you for once again for organizing such a fantastic conference. As I have long said this show is my favorite!" Great speakers - an "A" list of exhibitors and nice this year to see some new faces - and some young faces. I thought it was so well done. A huge thank you to you and your team for all the hard work." - Linda D.
Thanks for the kind words, Linda. In short, this year's Symposium was an unforgettable event. So if you’re interested in watching this event from the comfort of your own home or office, at your leisure – reserve your Video & Audio MP3 Online Access Pass to Vancouver immediately. Please complete the Reservation form here. Shortly after you place your order, you'll receive an email with detailed instructions on how to access your two free gifts plus the PowerPoint presentations and bonus coupon, as our thank you for joining us online. Access to your Video & Audio MP3s will be sent to you 14 days after the conference, by August 15th. 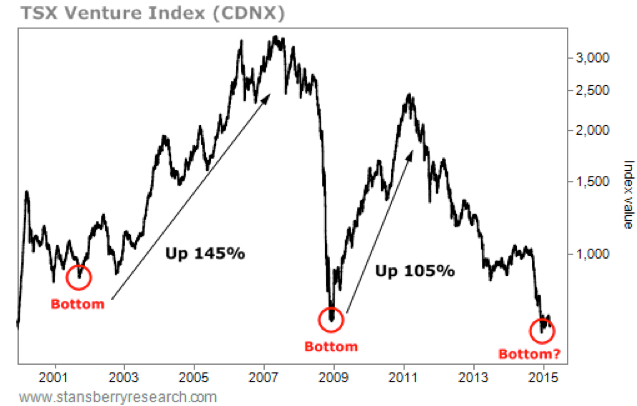 Chris Mayer Correctly Predicts US Market Correction: The Miners Are Cheap! We have the 2nd largest land package in the Carlin Trend after Newmont! Montan Mining (TSX:MNY): About to be in Production! The Fed Cannot Raise Rates!